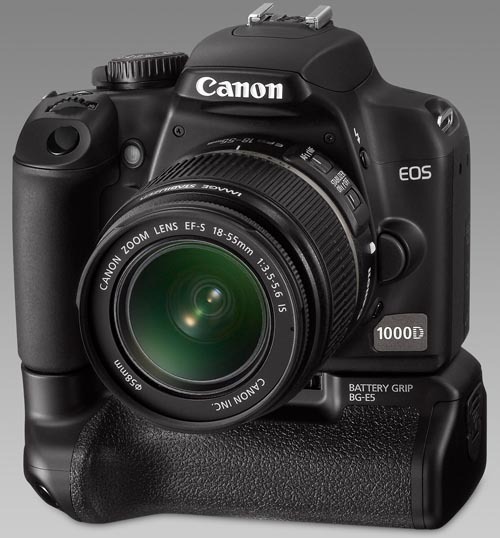 Canon has just launched the EOS 1000D, a new entry level D-SLR which slides into the model line up just below the EOS 450D. The EOS 1000D (Digital Rebel XS in the US) features a 10.1 Megapixel CMOS sensor, 7-point wide area AF system. 2.5 inch LCD display, and up to 3fps continuous JPEG shooting. With the lightest body of any digital EOS camera, the EOS 1000D also incorporates many of the new features found in its big brother, including the DIGIC III image processor, and Live View mode, and presents them in a less expensive package. 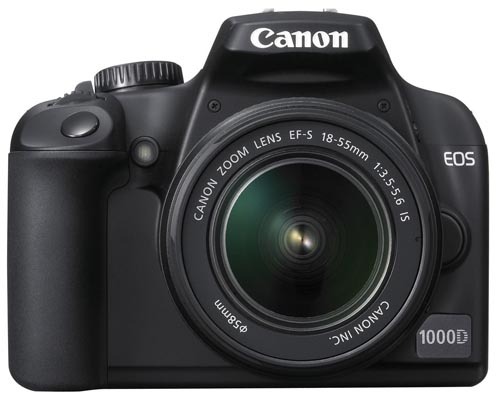 Amstelveen, The Netherlands, 10 June 2008: Canon today announces its latest D-SLR, the EOS 1000D. Featuring a 10.1 Megapixel CMOS sensor, 7-point wide area AF system and up to 3fps continuous JPEG shooting until the memory card is full, the EOS 1000D represents a more affordable entry point to the world of EOS cameras – whilst taking full advantage of over 70 years of imaging expertise. The EOS 1000D also features a DIGIC III image processor, as used in Canon’s professional D-SLR models. This allows continuous shooting until the SD or SDHC memory card is full, at speeds of up to 3fps – with the number of shots limited only by the size of the card. DIGIC III also delivers superior image rendering, rapid operation and virtually instant start-up times. Photo quality in every situation is aided by 12 custom functions, including Auto Lighting Optimizer – which corrects brightness and contrast during image processing, while improving skin tones in portraits by ensuring correct exposure for faces. 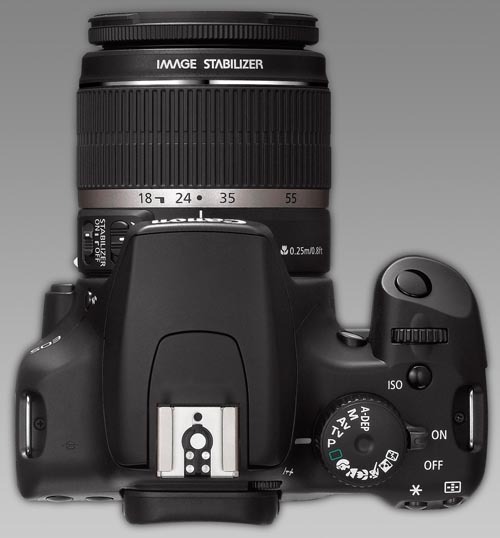 Photographers can also enable additional noise reduction for shots captured at high ISO speeds. This entry was posted in Canon, Digital Cameras and tagged Canon, Canon EOS, Canon EOS 1000D, Canon EOS XS on June 10, 2008 by jonathanb. 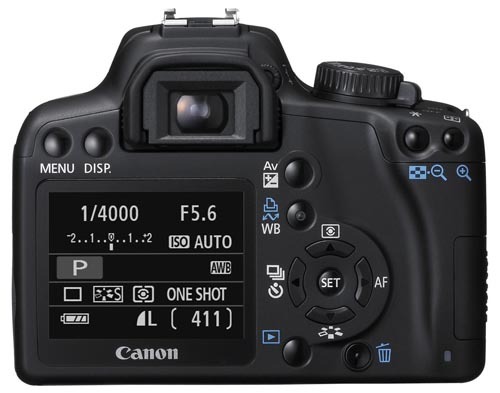 Outback Photo has reviewed the Canon Digital Rebel XSi / EOS 450D which features a 12.2 megapixel CMOS image sensor, DIGIC III Image Processor, 3.5 fps continous shooting, 9-point AF system, 3.0 inch LCD with Live View, and optical image stabilization. This entry was posted in Canon, Digital Cameras and tagged Canon, Canon EOS, Canon EOS 450D, Canon Rebel XSi on May 25, 2008 by jonathanb.